With Pets Uniting People Society (P.U.P.S.) neuter/spay program, there were over 200 cats/kittens neutered or spayed. This is because of two foundations that awarded P.U.P.S. 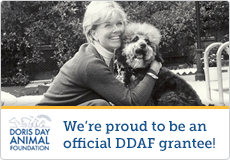 a grant, the Doris Day Animal Foundation and The Ohio Pet Fund. Without the assistance of these grant funds, we could not have come close to providing rabies shots and surgeries for this many cats. In addition, P.U.P.S. program could not continue if we didn’t have the assistance of the Springfield Animal Care Center. We appreciate all of you so much! P.U.P.S.’ annual fundraiser provided neuter/spay funding as well as other needs for the organization to continue. We wish to thank everyone who helped in making this event a huge success. Right before Christmas, three of the four part-Siamese kitties found forever homes. What a great way to celebrate the new year! Here are a few pictures that their new adoptive families sent us. Enjoy the new pictures of Lilly and Lucy as well as Jezebel. Thanks for adopting these gorgeous kitties!These kitties were orphaned due to the passing of their owner in October, 2013. In the year-end edition of PUPS Digest, the message and mission of Pets Uniting People Society (P.U.P.S.) is awareness to the problem of overpopulation of animals in our community, especially cats. As Director of P.U.P.S., I received a phone call back in May from a lady who fishes at a local lake stating that there were many cats dropped at this lake. She said they were starving. When I went to the lake to see first-hand, there were cats (approximately six), but they were not starving. There was indeed evidence of people feeding the cats from all the empty cat food cans. Although, they were still in danger because of some people being abusive towards animals, the elements of nature, and animal predators. Also, I was concerned about the cats multiplying. I spoke with the ranger of this location and well as the manager of the district wildlife reserve office and they informed me that reserves have been made a cat drop zone for years! Years!? It’s not only at secluded places, but public parks in town, ie especially Snyder Park and Cliff Park. Not only are cats abandoned at these type areas, but also in public, high-traffic areas. Recently, we had a phone call from an out-of-state couple traveling through Springfield. They stopped at the McDonald’s on South Limestone for a bite to eat and found a cat in the middle of the parking lot trying to eat a dropped McNugget. She was dirty, skinny, and scared. The couple went to many places, ie veterinarian offices and our local humane society and no one would help. They found us by a referral from either the humane society or a local veterinarian’s office. As director, I took the call and was ready to say “we are not animal control”, but the more the gentleman talked and described the situation…I knew we had to help. They were the most compassionate couple and when they arrived home to their own three kitties, they sent P.U.P.S. a nice donation to help this kitty in distress. We named her Mickey-D and just a week or so ago, she was adopted to a family from Springfield. Cats are discovered living around many area restaurants as they are trying to fend for themselves. We have taken cats away from many fast-food restaurants and fortunately have been able to place the ones rescued or in some cases, unfortunately, some had to be euthanized because of ill-health. However, most are feral, cannot be tamed, and need to be neutered/spayed, vaccinated, and returned to the environment where they came from even though it may be a dangerous one. In addition, P.U.P.S. is not designed or equipped to be animal control or rescue. We can help, but that is not why we were established. We were organized for “education, awareness, and responsibility in animal welfare” as no other nonprofit, 501c3 organization was providing this information to the public. We need better coverage of the problem and something to be done about it. We can help, but we cannot do it alone. It requires assistance from a much larger group to get the overpopulation controllable, humanely, and not euthanizing them. Let’s move forward and solve problems, not create them. Even though we have two, large pet protection organizations in our community and are doing what they can, it is not enough. That’s why you are seeing smaller groups like P.U.P.S. sprouting up. The problem is huge! In reality, there will always be problems, but let’s work together to make them less severe. We cannot just close our eyes and pretend an animal overpopulation does not exist. First, here’s the awareness to the public about the problem. Second, if anyone sees any dropping activity, call the authorities, report it. Third, don’t think cats can fend for themselves because they cannot, especially if they are domesticated and lived in a neighborhood or home. Innocent animals should not have to fend for themselves because of violators who either don’t care or think these animals will be cared for by someone else. How sad and ignorant is this? Our organization P.U.P.S. and others like us are trying to educate the public about what is happening in our community. We do not want citizens to be uninformed. We have a problem and it’s going to take our entire community to do something about it. It also is not going to go away. The answer is neuter/spay and education. The following is an open letter to our community about how it takes an entire community to change things. Even though P.U.P.S. is united with other pet protection organizations because of the plight of animals, our network still has to tackle an age-old question. How do we make this world (community) a better place in regards to animals? Our community has two long-term, well-established animal organizations plus many small ones such as P.U.P.S., but we still have a huge, homeless animal population, especially cats. The reality is that there will always be problems; however, perhaps, we can decrease their severity and try to make things better. What’s that cliché? It takes a village to raise a child. Ironically, the welfare of a child and an animal go hand in hand. In collaboration with a child’s parents, it takes an entire community to teach children to be responsible, productive citizens. A parent should teach a child when he/she is a toddler about how to handle and care for a puppy, kitten, hamster, etc. If one sees a child attempting to pick up a pet by its tail or neck, gently correct the child and give a positive reinforcement. If only it was that easy! My husband Pat says I come across like I’m the pet police. Maybe so, but I believe strongly in a pet being a part of the family, treated with respect and dignity. Pat said: “Carolyn, not everyone sees an animal like you do.” I thought…well, why not? On Guide Star, a national exchange of nonprofits, our leadership statement reads: In order to get to the root of the overpopulation of pets, our society needs to stop just putting band-aids on the wound. Humane education in animal welfare is needed in our communities. Just as a DUI person is required to take a course in “Driver’s Training” the same should be true for a first-offense animal abuser in taking a course in “Animal Care and Welfare”. If there isn’t educational curriculum for humane education in the schools, there should be! Our P.U.P.S.’ board members believe that an educational curriculum needs to be designed beginning with the elementary grades, kindergarten or first grade. Humane education is much more than just about animals. It’s about our environment! It’s about people! It’s about caring! It’s funny. I never thought an educational curriculum was desperately needed about compassion in our schools, but it is! “Love Cats” group ask this graphic to be shared and it’s so true. What does P.U.P.S. do for awareness? We report findings here on our website/blog and report news in our hard copy publication as well. We have a PUPS Club at SpringfieldHigh School, participate at NorthwesternHigh School’s craft/trade show every year handing out educational materials, participate at Nonprofit Community Day at the Upper Valley Mall, and many other community outreaches. We host our own annual event “Autumn Leaves” which is a brunch/auction to raise funds and awareness to our mission: education, awareness, and responsibility in animal welfare. Plus as P.U.P.S.’ Director, I am invited to speak at many civic groups to get the word out on our mission. If you have questions or need more information about P.U.P.S., email me at info@pupsunite.org or call me, Carolyn, at (937) 244-4604. Pets Uniting People Society emphasizes the importance of responsibility of pet ownership. It has from the very beginning. It’s difficult to believe some people have never heard to neuter/spay! Yes, that’s correct! We want to change that.We have help from many organizations that feel the same as we do. Please stand with us as we offer some in-your-face promotion about “education, awareness and responsibility in animal welfare”. Promote, promote until more animals are neutered/spayed. Please follow along with the steps in being a responsible pet owner and pass the information on to as many who will listen and want to learn how to make a lifetime commitment to an animal. Number one step is to neuter or spay a pet when age-appropriate to do so. Next, make sure the animal is up-to-date on shots and vaccines, especially if pet is around other animals. Oftentimes, Dottie, wife of P.U.P.S. Board member Dave, comes to the rescue of kittens, but is not a rescue! Dottie vows it’s all about networking. She agrees with the philosophy of Pets Uniting People Society with stressing education, awareness, and responsibility. No one emphasizes this more than Dottie. She does what she can for extreme emergency cases only. She is not a rescue, per se, and let’s everyone know that. If one can, she feels animal advocates should do their own “rescuing and fostering” as she does. She offers tips to anyone who asks and is willing to help promote any cat or kitten that needs adopting. She utilizes social media the most or just word of mouth to get the little charges into a nice, adopted home. It’s been no easy task as she had three from one litter that was found along the roadside that had ringworm, plus other problems. They needed a veterinarian-prescribed dip every five days until they were healed (more than 11 weeks). This went on from five days of age until they were adopted. Ling became a beautiful kitten thanks to Dottie. She is adopted and now lives in Marysville, OH. Dottie’s family is concerned that she takes on too much, but I think Dottie knows when to say “when” and I think she has said “no” many times. Dottie receives help from her family, especially her husband, and a P.U.P.S. volunteer Suellen who has been so good to help her in the daily tasks. Here’s an added comment from Dottie: “It’s really hard. You get so attached to them especially the babies that you bottle feed and they think I am their mother or the ones with extra needs.” Thanks Dottie, Dave, and Suellen for all you do!